The word chucks is the common slang term for a pair of Chuck Taylor sneakers. Where actually did the term “chucks” come from. After all it’s a word everyone seems to use when talking about Chuck Taylor shoes. To find out more, The ChucksConnection completed some research on the origins of the word “chucks”. At first glance it may seem to be a simple word; in reality the word usage of “chucks” in the English language has a lot of complexity to it. There are dozens of dictionary definitions applied to it in proper English and slang, and it functions in grammatical usage as a noun, verb, and adjective. The word “chucks” has a long and varied history as a slang word in the English vernacular. Over the past two hundred years, it has been used to describe a ship’s bosun, a schoolboy sign of acknowledgement, an animal, throwing something, regurgitation, giving up, a generic name for men, and of course as the possessive and plural nickname for people named Charles. In the past decades, a new meaning for “chucks” has emerged: a noun which is the slang word for a pair of Chuck Taylor shoes. This slang word for these sneakers has been used in published articles written about them, become a common word in everyday vernacular employed especially by people who wear the shoes, and has even been recognized in scholarly research. In 1984 Jonathan Green published The Dictionary of Contemporary Slang, (New York: Stein and Day) about new slang words that have emerged in the modern English-speaking world, including the United States, the British Isles, Canada, Australia, and New Zealand. On page 51 he includes a definition of the noun chucks: “Converse All Star baseball boots; signed by designer Chuck Taylor”. The ChucksConnection believes that this usage for the word “chucks” originated in the 1970’s, when athletic shoes started becoming popular in all generations; those baby boomers refused to stop wearing them just because they were in their twenties and thirties. This popularity led to the design and marketing of special shoe models for different sports activities like running, training, tennis, and basketball. With the arrival of many competing brands and models, especially from Nike and addidas, Converse had to react and started coming up with new shoe designs like the Dr. J leather basketball shoe. Up until then you could say “Converse” or “Cons” to describe Chuck Taylor shoes, and everyone would know what you were talking about. Now there were many models to choose from, and with the public becoming so “sneaker-aware”, different names began to emerge to describe popular models. The companies all used endorsements to market the newer shoes, and these names would be associated with that product, often in a shortened or abbreviated form, as people like to do. People who continued to wear original Chuck Taylor shoes didn’t have a highly paid celebrity endorser, but being a loyal lot, they just started using the term “chucks” to describe their favorite shoes, after the shoes now deceased designer. 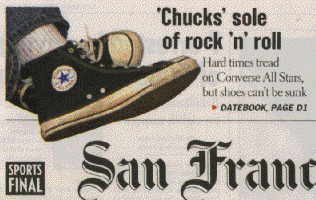 Another quirk about the usage of the word “chucks” is the capitalization factor. While most people capitalize the word when they write it down as “Chucks”, the capital C is not necessary or grammatically correct. When people write “Chucks”, they are thinking about Chuck Taylor, the man behind the development and promotion of these classic sneakers. But his name was “Chuck” not Chucks. When his name was used formally, it would appear as Charles “Chuck” Taylor. The word chucks refers to a pair of shoes, and that is the reason it is plural, not singular. It is not the proper name of a person, and so the capitalization is unnecessary. Interestingly, the Converse Company never has used the word “chucks” in marketing Chuck Taylor shoes. They have always been sold as Converse All Star “Chuck Taylor” basketball shoes. This is what you see on their boxes, in catalogues or other marketing. These days they don’t sell them as basketball shoes anymore. Now they are marketed as casual footwear, cool-looking sneakers, in hundreds of models and colors. The company did take out a trademark on the word “Chucks” in the 1980s, but that was for a line of clothing products (sweaters?) that didn’t succeed or was only offered for a short time. And the correct use of a trademark is as an adjective, not a noun, like the usage for chucks has become… “I really like to wear my chucks.” To enforce such a trademark as a noun would require constant advertising and promotion to keep it in the public mind. Just ask the Coca-Cola Company how much they spend a year reinforcing the idea that “coke” is a noun that refers to their soft drink product. So the word “chucks” is really the peoples’ word for these canvas shoes. In the last fifteen years, public usage of the word “chucks” as a noun referring to a pair of original Chuck Taylor shoes has continued to increase globally and independently, in conversations and in the media. These days, when you talk about your “chucks”, most people already understand what you are talking about. If they don’t, just point to your shoes!